The following interview was written by Melissa Hagedorn for the Northwest Yoga Conference website. When I connect with yoga teacher Jo Zukovich on the phone, I quickly realize that I am in for a treat. Though I am supposed to be focusing on learning more about Jo and her teaching methods, her humility guides her to share about her incredible teachers, including B.K.S. Iyengar. Can you tell us about the beginning of your yoga practice and how you found your way to teaching yoga? I sought out yoga in 1979 after a life of dance and ballet practice had led to shin splints. I kept hearing great things about a local teacher, Mary Dunn. Mary taught Iyengar yoga which is no surprise as her mother, Mary Palmer, was instrumental in bringing Mr. Iyengar to the United States for his first teaching tour in 1973. Not unlike others, when I attended my first class, I realized how good the practice felt and started to attend classes with Mary as much as I could. After a few years of dedicated study with Mary, I became an assistant at the yoga studio. In 1984, I had the opportunity to study with Iyengar himself when he visited San Diego and it was the best class that I had ever taken. Within the next year, Mary departed for New York City to start the Iyengar Association and I stepped into the role of teacher. 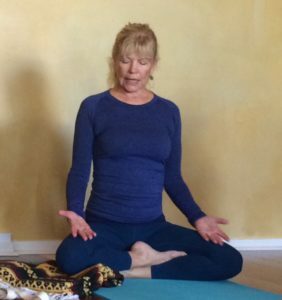 Because of my passion for the practice and sharing it with others, I opened several yoga studios, one by one, and started training yoga teachers in 1990. It was not in the 200-hour format that is commonplace today but rather in a mentorship style. Did you travel to India to study with Iyengar and if so, what was that experience like? In 1988, I traveled to India to study with Iyengar and completed the pilgrimage three more times in the 1990’s as well as studying with him when he traveled to the US. Studying with Iyengar was different every time. We would have class time with Iyengar in the mornings and practice time in the afternoon. Iyengar would do his own personal practice alongside the students in the afternoons. It was one of the most valuable learning opportunities for me with my practice. Though Iyengar’s presence was notable during class time, it was subtle during practice time. In fact, you might not even notice him. While students were huffing and puffing their way through their practice, Iyengar moved silently with grace from one pose to the next without strain. His practice was a moving meditation and it was a beautiful thing to watch. Occasionally, he would come and adjust a student during the practice time. I knew, and could feel that others knew too, that we were in the presence of somebody who knew what they were doing and what they were about. Yes, there was a physical aspect to the yoga practice but ultimately, the practice was a tool to help you evolve as a human being. Practicing with Iyengar lasted well beyond the time spent in India. Once I returned home from India and started to apply all that I had learned, I had the realization that yoga was not only about the physical postures. 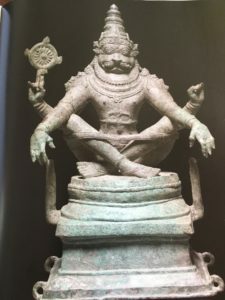 My understanding of the practice started to deepen, leading to new insights that were ultimately connected to this great yoga lineage. You studied with Iyengar several times in the US. Was that experience different than studying with him in India? I remember attending a San Diego yoga conference in 1990 where Iyengar was present. He wasn’t really teaching any workshops. He was engaging and speaking with yogis and helping out. On the last day of the conference, I was told there was going to be an impromptu yoga class. My husband and I showed up and discovered that Iyengar was teaching the class. It was the first class I had seen Iyengar teach where there were hundreds of yogis. In India, there were typically about 50 yogis in class. What I remember the most about this class with Iyengar in San Diego was his keen sense of awareness and ability to provide a verbal cue to one specific individual in a room of hundreds. How did Iyengar come up with yoga props? In 1937, Krishnamacharya sent Iyengar to Pune at the age of eighteen to spread the teaching of yoga. Iyengar started by teaching strong and capable military soldiers but it wasn’t long before he was teaching people that had a wide-range of health conditions. Iyengar felt that students needed to stay in poses for a certain duration of time to reap the benefits yet often times a student would be dealing with a health issue that would limit the students ability to do so. 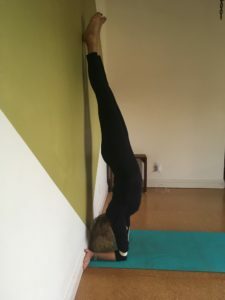 It was during these early years that Iyengar first started to develop props to use during the yoga practice to extend the time a post could be held. In class, he would provide the student with a piece of furniture or a rack to use as an aid. Then Iyengar started experimenting at home and eventually came up with the block. It was a statue that inspired him to create the yoga strap. Iyengar saw a statue of someone sitting in Siddhasana with a belt around their knees and back and realized that a strap would help students stay in the poses longer. What about the yoga practice has led to your life long dedication to the practice? The first difference I noticed in my life from the yoga practice was in how I walked but it didn’t take long for me to discover that the changes would extend far beyond the physical. The practice changes you physically and emotionally. I feel strongly that each yogi should have their own personal practice. I know that many people are intimidated by the idea of creating their own practice but it really can be something as simple as 10 minutes of practice. A personal practice allows you to take what you learned in class and apply it to your life. This is where transformation can happen. I love teaching yoga and couldn’t imagine doing anything else. My favorite piece of advice is to go slowly on the path. You have been practicing for a while.Have you had to deal with injuries? About 8 years ago, I had physical setback with my yoga practice. All of a sudden, much of the physical asana was no longer available to me. Honestly, I was initially devastated but I kept practicing and slowly I regained many of the postures that had been lost to me. Now, when I reflect back on the experience, I feel blessed because I learned much about myself during that challenging time. Speaking of physical setbacks, you have been acknowledged by paraplegic Matthew Sanford as his first teacher and helping him to cultivate a presence within his body through awareness, breath and attention. What was it like working with Matthew and do you have any advice for yoga teachers in working with disabilities? Matthew had been going to school in Santa Barbara, where I used to teach once a month, and someone referred him to me. I would give him a few poses to try and he would practice them throughout the month and we would reconnect the next time I was in Santa Barbara. He was an exceptional student and applied himself to the practice. It didn’t take long for Matthew to feel inner body changes from the practice and soon we started to practice together intensively for many hours at a time. I learned a lot from working with Matthew. He has now gone on to found Mind Body Solutions and offers training on working with people with disabilities. If you are interested in working with disabilities, I highly recommend seeking specialized training with someone like Matthew. Beyond that, I would also acknowledge that each injury is different and the teacher must go slowly and have an ongoing conversation with the student to ensure the practice is helping them. You and I connected because of our mutual association with UnCruise. Have you ever UnCruise’d before? Yes, twice. About a year ago, my daughter took me on an UnCruise to the Sea of Cortez. I was impressed with how well planned and thought out the experience is with UnCruise. There are endless options for activities from hiking, snorkeling, kayaking and more. The food was amazing, the employees were kind and knowledgeable. The dozens of fellow cruisers are like-minded and it is easy to make new friends. I loved the experience so much in fact that before I even got off the boat in the Sea of Cortez, I booked another UnCruise for my husband and I to the San Juan Islands and Olympic Peninsula. You are leading a “Rivers of Wellness” cruise with UnCruise in October 2017 along the Columbia and Snake Rivers. What can guests expect on this cruise and from your yoga classes? 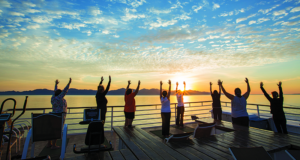 The “Rivers of Wellness” UnCruise will offer daily yoga classes, nutrition workshops and sound healing as well as the typical excursions and adventures UnCruise is known for. Yoga will be offered both on the boat and along the river. In my yoga classes, I teach a mindful approach to the poses and I keep my eye on students to ensure that they are provided with modifications that best serve them. One thing I am looking forward to in this immersive environment is the opportunity to be available for yogis to provide guidance and help answer questions about their practice. This is the perfect opportunity to set aside the daily stresses of deciding what you are going to eat, tidying the house or running errands and shift your focus towards going inward.